I love, love, love the arches. Love the half-wall separating the sinks and the toilet, and love the simplicity of the same tile but in different cuts throughout the room. 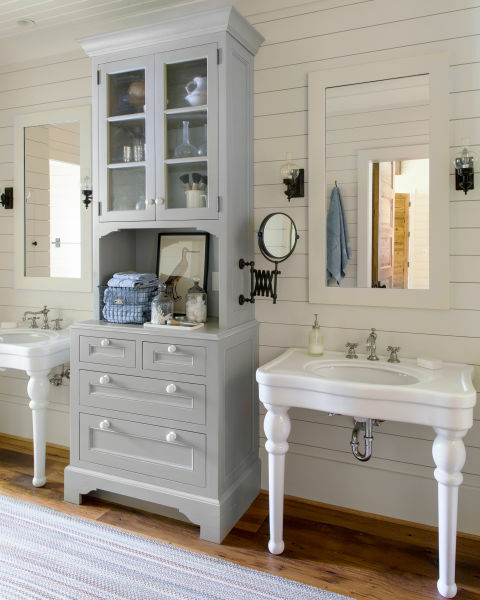 I found the below pic in Country Living magazine and realized I loved the ceramic console sink look. Isn’t that adorable? Loved the his and hers. 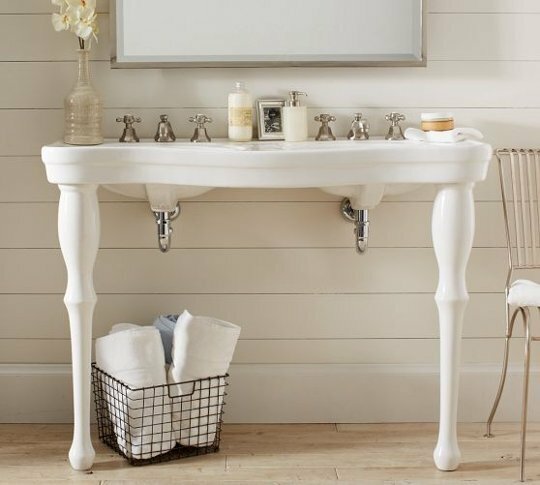 There’s something that looks so classic traditional and yet farmehouse-y to me about a double console sink. I really like its simplicity but I love getting two sink basins in there. 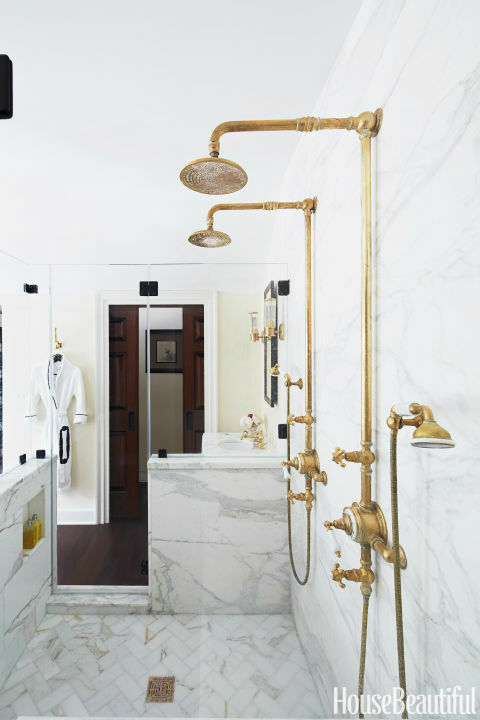 I love, love the brass fixtures with the calacatta gold marble tiles. So, so beautiful. And fitting for an old house. This picture also made me crave two shower heads… how luxurious! Anyway, what do y’all think? Can’t wait until it’s all done and we can compare the finished product to the motivating forces behind the decorating decisions. 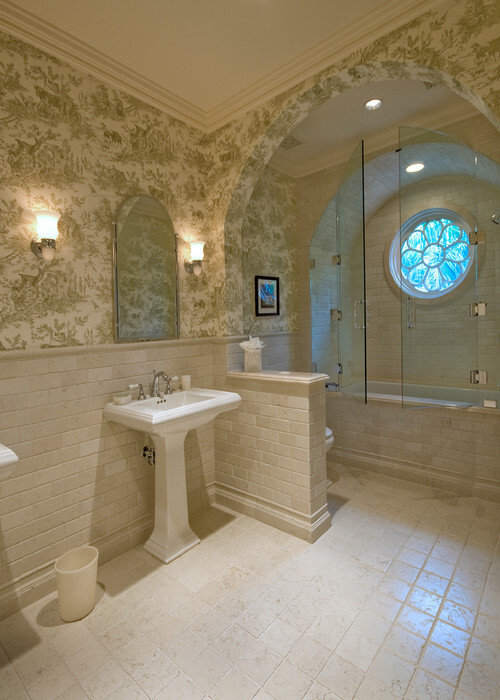 Hope this bathroom turns out as well as my dreams! As usual, you both have impeccable taste. I personally would opt for the arches bathroom. Much more elegant than the others. But, whichever you choose would “fill the bill”. Thanks Aunt Bette!! Definitely love those arches. Gotta get you down here to visit and see everything in person! It is so helpful that you are sharing these magazine pictures, that you used for ideas. Thank you…. And they worked !!! !